← Ode to the Other TSA Employees Who Blogged and Vlogged Before Me. Update: Former TSA Screener/Blogger, We Hardly Knew Ye. He’s not big on spell check, but his heart’s in the right place. I just found the other former TSA screener’s blog. He had a decent thing going there, and then suffered the all-too-common new blogger’s fate: he ran out of steam after a few months of writing, and abandoned the site. Unfortunately, the links to the pictures he drew on the exit lane at his airport are now dead, except for two. It helps to be a TSA employee in order to understand what’s going on here. His comics were pretty good. I just read nearly his entire blog (the first time I found it, I only read a couple of his posts along with his comics), and am a little creeped out by how universal certain TSA employee experiences seem to be (read his posts on doctor’s notes and gum-chewing. It’s uncanny). 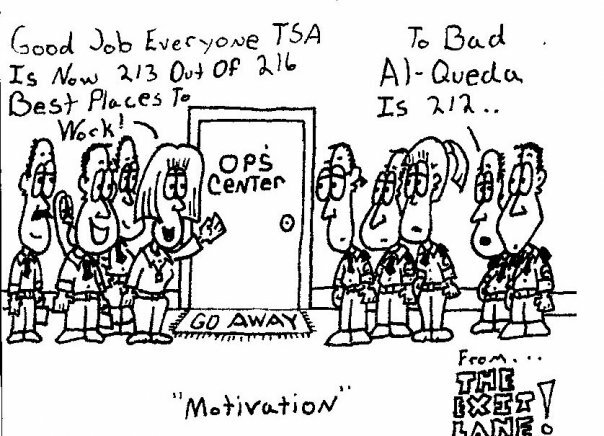 If you’re reading this, Sean, put those TSA comics back on your site, please, and knock out a few more posts. My Name is Sean Langdon and I just resigned from what should be known as the joke of airport security. This is the organization known as the Transportation Security Administration. The airport I worked at was The Greater Cincinnati Northern Kentucky Airport (CVG) I began working for them on day one of their roll out nearly seven years ago. I like many others thought in the beginning that we were serving our country. But let me tell you it was seven years of pure hell and seven years of my life wasted. I’d like to buy this man a beer. 1 Response to Update: Former TSA Screener/Blogger, We Hardly Knew Ye.